Lush fans of palm frame the scene on the cover of this month’s Travel + Leisure magazine. A white-jacketed waiter sets a table for four on a peaceful patio overlooking a river, shaded by a rose-pink umbrella. The magazine touts the country’s “mystical Buddhist purity” as a wonder to experience “before the place gets wealthy and ugly.” In addition to unpleasantly appealing to orientalist fascination, this depiction glosses over what many Burmese pro-democracy activists say is a still deeply troubled human rights environment. 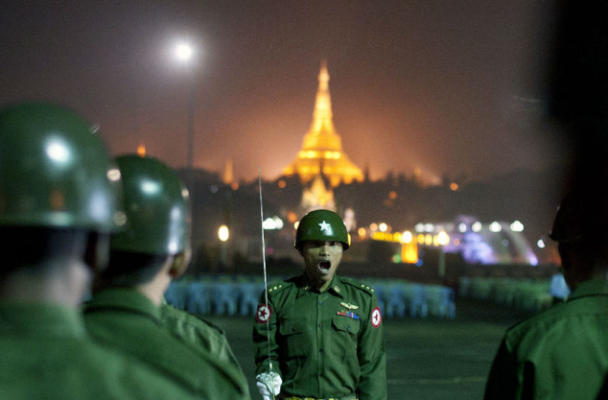 Despite a series of reforms implemented since President Thein Sein took office in 2011, after nearly 50 years of harsh military rule, the iron-fisted tactics used to control the country have hardly receded. The reforms, which included the release of thousands of prisoners (although too few political prisoners, according to activists) and the allowance of privately owned newspapers, have led to rounds of applause from the U.S. government — which has “employed a calibrated engagement strategy to recognize the positive steps undertaken to date and to incentivize further reform,” according to the State Department. Labor unions have been legalized, a national conciliation process formalized, and the Asian Development Bank has begun allowing loans to Myanmar after a 30-year freeze in order to encourage economic development. For years, however, activists and journalists have been saying that much of what has been promised hasn’t come through, pointing out that what was once seen as former U.S. Secretary of State Hillary Clinton’s major achievement in foreign policy is turning out to be anything but. What’s more, just as Travel + Leisure is hitting newsstands, a new report highlights an underreported story of sexualized violence that continues in the country — violence intrinsically protected by an amnesty provision in Myanmar’s constitution that prevents the military from being prosecuted for crimes. The report, along with existing accounts of countless other human rights abuses in the country, might — and should — make potential tourists think twice about where they want to spend their money.